April 4, 2012 - Boeing successfully completed a parachute drop test of the company's Crew Space Transportation (CST)-100 spacecraft on Tuesday at the Delmar Dry Lake Bed near Alamo, Nev. CST-100 is part of the Boeing Commercial Crew Transportation System (CCTS), which will provide the United States with the capability to transport people and cargo to the International Space Station (ISS), the Bigelow Aerospace Complex and other destinations in low Earth orbit. An Erickson Sky Crane helicopter lifted the CST-100 test article to about 11,000 feet and released it. Three main parachutes deployed to slow the capsule's descent before six airbags inflated, providing a smooth ground landing. The event was the first drop test of the fully combined vehicle landing system, including all elements. "This successful test is a tremendous milestone that brings Boeing one step closer to completing development of a system that will provide safe, reliable and affordable crewed access to space," said John Mulholland, vice president and program manager, Boeing Commercial Programs. Boeing has scheduled additional tests to be performed in 2012, including a landing air bag test series in May, a forward heat shield jettison test in June, and an orbital maneuvering/attitude control engine hot fire test in June all to gather additional data on key functional elements of the spacecraft design. The Boeing Commercial Crew program includes the design, manufacture, test and evaluation, and demonstration of the CST-100 spacecraft, launch vehicle and mission operations all part of Boeing's Commercial Crew Transportation System for NASA's Commercial Crew Development program. 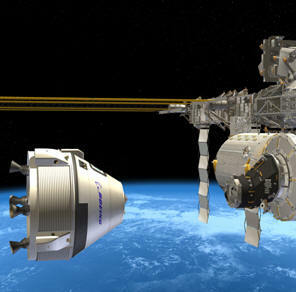 The CST-100 is a reusable capsule-shaped spacecraft based on proven materials and subsystem technologies that can transport up to seven people, or a combination of people and cargo. Boeing has designed the spacecraft to be compatible with a variety of expendable rockets. The company has selected United Launch Alliance's Atlas V launch vehicle for initial CST-100 test flights in 2015-16.